JCH2/Hammer & Nails-The Boat House Wine Co.
Venue : JCH2/Hammer & Nails-Boat House Wine Co. 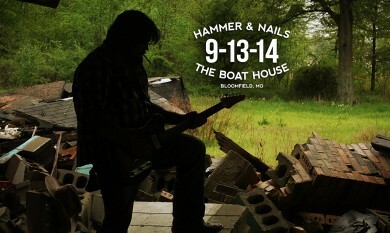 This here will be the first show billed as Hammer & Nails. Essentially I called these guys after I realized the album I was making at the time, The Fall, was going to end up being a pretty good record and I would need some guys to back me up as I would be doing shows in support of the album upon its release. So with this “Chapperson Manifesto” in mind I called up the best pickers and skinners I had met over the past years of playing dives, dance halls, barrooms, festivals, parking lots and all the living rooms and dark alleys in between. To my dismay my first choice in regards to each instrument I yearned to have on stage with me every night, agreed to play a small get together which would pay very little, but would allow us to test the waters and to see if we could once again take 3 or 4 different influenced and experienced pickers and audibly comfort one another all the file by the 3rd measure of each song have em all dancing together.